The Little Missouri River is located in southwest Arkansas. 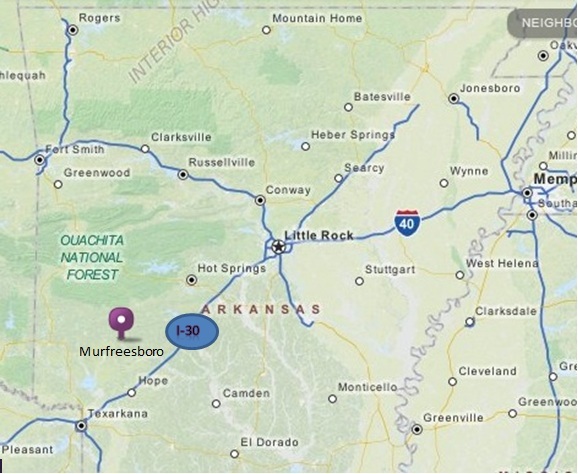 The Class II+ section of the river between the Lake Greeson Dam (often referred to as the Narrows Dam) and Murfreesboro can be paddled in the summertime when electricity is being generated. Many natural Class II rapids created by bedrock outcrops and boulders occur along this section of the river. The speed and continuity of the current move it up to a “plus” category over a regular Class II. If you tip over you will need help to gather your gear before it is washed out of your reach; you may also want help to get yourself to shore. Besides the natural rapids, there are also man-made rapids formed by riprap weirs. The weirs are not dangerous to paddlers; their backslopes are very gentle and do not create hydraulics that will trap paddlers or swimmers. They add some gentle surfing opportunities and a slide-like experience. There are four weirs between the dam and the “Low Water Bridge” take-out. The local name of “Low Water Bridge” baffles new users of the river since the low water bridge was replaced by a high bridge decades ago. The area is still referred to as the “Low Water Bridge” by locals and by the Arkansas Game and Fish Commission in its published reports. 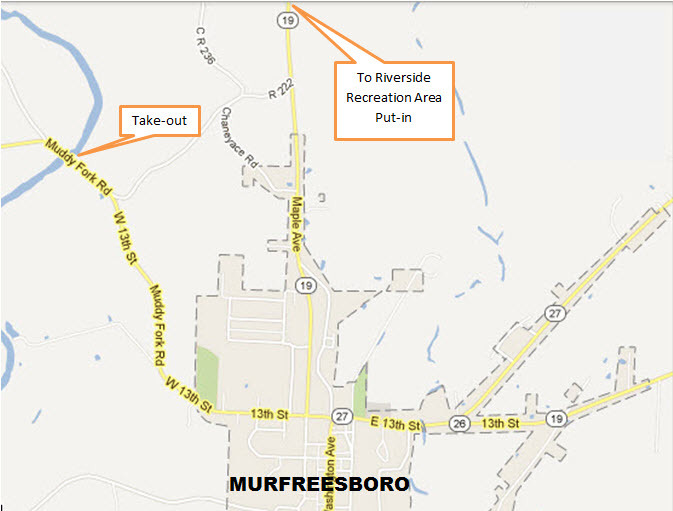 The bridge is located about a mile and a half west of Murfreesboro on West 13th Street, adjacent to the Murfreesboro water treatment plant. It should be noted that, while the river is not difficult, the current is swift over long stretches. If you become separated from your gear, you will probably need the help of other paddlers to round it up for you or you will risk losing it. The banks are vegetated to the water’s edge with brush and branches overhanging the water in most places; that makes getting onto the bank difficult or impossible in many places. There are no gravel bars. That’s life with fixed flow rates below dams. The river has the most natural feel when only one generator (8 Mw) is running; that is, many rocks remain partially exposed, offering lots of eddies and gentle surfing at many places. The current is swift, calling for good boat control to avoid obstacles. The water is chilly even in the summer months. When two or three generators run (16 Mw or 24 Mw), the river becomes bank full, very swift in places, and increases the ability needed to avoid obstacles. Some surfing spots are best after the release achieves full flow; others are great as the water is rising and then wash out. It is easy to keep up with the leading edge of the flow if you are on the water at the Riverside Picnic Area put-in when the siren at the nearby dam sounds and generation begins. As the water rises, you can play at each spot until the flow rises to the point at which it no longer entertains you, and then paddle ahead to the next point of interest. The rise is quick in the rapids between pools. As little as 20 minutes can take the shallower rapids from dry to prime to smooth. Wading fishermen must head for the bank immediately upon sensing the flow increase to make it safely to shore. It takes about 40 minutes for two generator flow to reach the Hinds Bluff Access, and about 2.5 hours to reach the rapid at the top of the pool at the last weir, which is within sight of the take-out. THE GOOD NEWS: Releases are typically scheduled during the afternoons of the summer months and the release schedule is on the internet at https://www.swepco.com/info/recreation/. 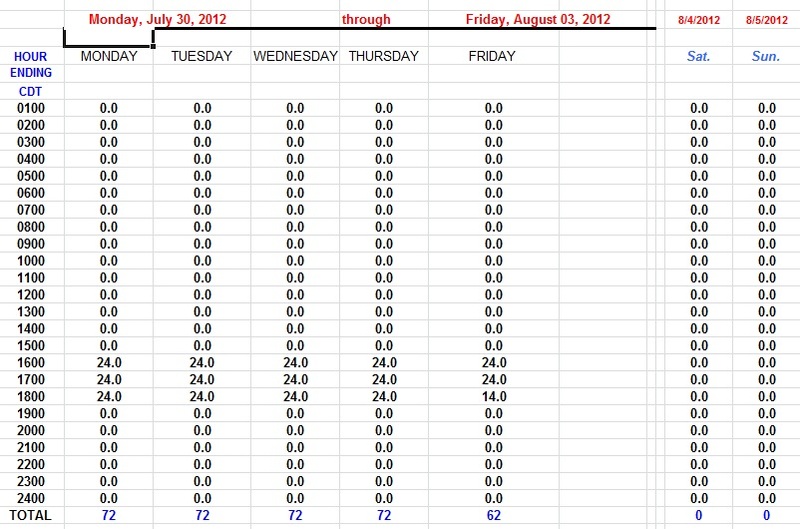 The website lists the schedule for each week in the form of an Excel table. Military time is shown in the leftmost column; approximately 8.0 is shown in the table for one generator, 16 for two, and 24 for three. Note that the time column is set up to be the “hour ending at”, so that if you see 24 in the row across from the time of 1400, the three generator release started at 1300, or 1:00 p.m. An example of a release schedule is shown below. THE BAD NEWS: You will notice that the generation schedule rarely includes weekends. Monday through Friday is typically when there is water in the river. There are three places you can drive in to public access points on the river besides the put-in and take-out: River Ridge Access is approx. 1.5 miles below the dam, Hinds Bluff Access is approx. 2.0 miles below the dam, and Old Factory Site picnic area is located approx. 4.5 miles below the dam. The put-in (complete with flush toilets and paved parking, picnic tables, handicap fishing access, playground, pavilion) is at Riverside Picnic Area on Highway 19 about a quarter mile below the dam. The take-out is reached by driving west on W. 13th Street in Murfreesboro. Outside of the city limits this street becomes County Rd. 222 or Muddy Fork Road. It’s about 1.5 miles from the Hwy. 19 intersection in town to the take-out bridge. The city owns the property on the east side of the river upstream of the bridge and has a water treatment plant there. The upstream side of the bridge on river left can be accessed by a commonly used drive between the water plant fence and the road; it is clearly visible from the pavement. There is an eddy there, but it is small and requires good timing to catch. This area also offers park-and-play at a natural rapid if you paddle upstream for one mile of flat water to the beginning of the pool created by the final weir. Park-and-play is also available upstream of the Hinds Bluff Access at a natural rock outcrop; one of the man-made weirs is located at the Old Factory picnic site and provides mild entertainment that can also be driven to. 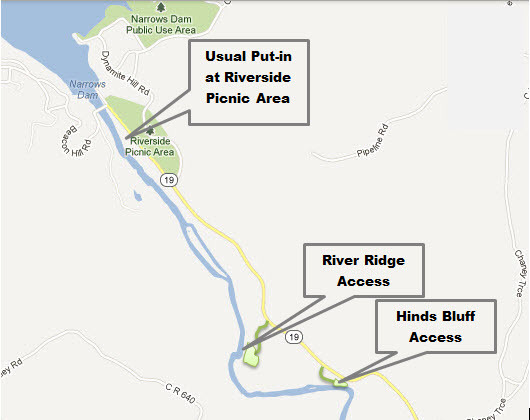 A map showing the put-in at Riverside Picnic Area, and accesses at River Ridge and Hinds Bluff is below. 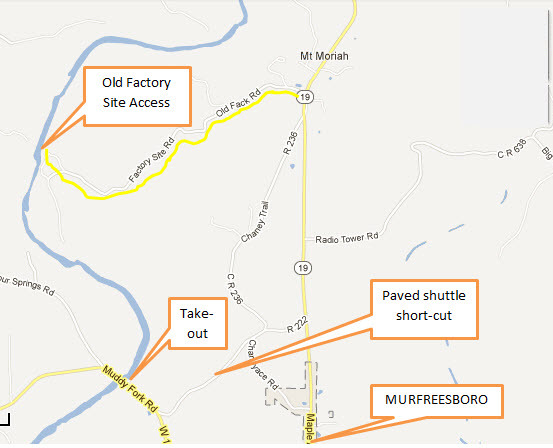 The map below shows how to get to the Old Factory Site access. A video link to a 2012 outing is below.